31 days. 31 years. 5 movies per year! END OF THE ROAD! This has been a LOT of work, but I’ve thoroughly enjoyed doing it every day across October, and to all the readers who followed these posts each day – I thank you. I’m a mainstream kinda guy when it comes to horror movies, but I HOPE that one or two of my choices were new to some of you, and perhaps you will consider checking them out in the future. This final post features five movie choices that come from 2015 AND 2016. Why? I shall tell you. 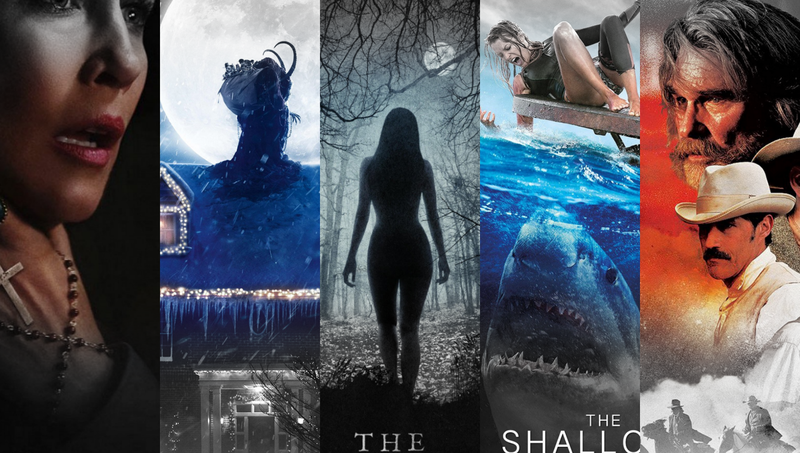 It generally takes me a couple of years to ‘catch up’ with the many horror movies that come out each year, which means I simply haven’t seen ENOUGH films from late 2015 and all of 2016 to create a separate list for each of them. I’ve seen some of the bigger releases (as you will notice), but there are still many smaller productions to discover, and that will happen over time. Another crowd pleasing hit from James Wan, who really has become a bit of a horror directing hero. His movies are all about scares rather than blood and gore, so they aren’t going to be praised by all, but I’m personally thrilled to see them making so much money. The original Conjuring was brilliant, and even though I need to see this again soon to be sure, I THINK the sequel was even better. A ‘horror western’ starring the LEGEND Kurt Russell?? … I’ll have some of that! Bone Tomahawk sounded awesome, and it WAS awesome. I love it when something comes along that dares to be different, and this really was a refreshingly original punch in the face. Russell was in SO many movies I loved when I was a kid, and it’s a beautiful sight to see him still going strong all these years later. Each year on Halloween night I NEVER fail to watch Halloween 3 and Trick’r Treat. On Christmas Day I have Rare Exports, Gremlins, and now Krampus! It’s a keeper, I loved it! Another one of those stylish horror movies we’ve been getting recently that seem to split opinions right down the middle. Many people think it’s a modern masterpiece, while others just said it was a pretentious pile of crap. I personally thought it was visually stunning modern horror experience, but I CAN understand why it wouldn’t appeal to everyone. I didn’t fall in love with horror by watching movies like this, but if the genre stays strong because directors and writers are constantly trying to challenge our expectations and themselves, then that’s good news for all of us. Now, can we have a new Friday and Halloween asap PLEASE!